Considering this comes from a MIT prof, I'm disappointed. Where's the proof, or attempt of, for how these numbers actually contributed to team wins? Maybe I'm spoiled by Dave Berri (http://dberri.wordpress.com) , but if I just wanted to see a list of numbers defining performance I'd stick with USA Today. Hey Doc. I think people are just asking to see the components of the formula and how they are weighted (for transparency obviously). Any chance you can show us the spreadsheet? 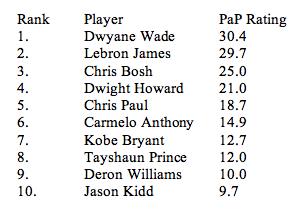 I think it's interesting that guys like Kidd and DWill are down at the bottom while CP3 is in the middle. What do you think about the intangibles that these 3 PGs bring to the game that cannot be fully calculated using formulas? Is there a +/- assessement (like they do in hocked) as part of the PaP? Thanks. Keep up the the good work. As much as I'd love to see the formula, I think most everything would show pretty similar results. Was your formula derived imperially or heuristically? So if Paul and Williams are both scoring guards, why does Paul rank so much higher than Williams and Kidd? It can't be about playing time, because Prince is ahead of them and he plays sparingly. It is time to give Paul the title of best American PG in the league. Also, defense was emphasized, and Williams is too slow to stop quick point guards (like Paul). I also like the top 5 as a starting lineup. Great work doc, really interesting stuff. I'd only disagree with the slight change made from your post (solid 5) to the poster above me (ideal 5). The notion that a starting five without Kobe would be better than one with him is incorrect. Can't put a price (or a numerical value, apparently) on him shutting down the other team's best player. You really didn't answer the question of how you came to decide on this formula? Did you run regressions and correlations between box score stats and team performance? And when you say that you ran several other composites it makes me worry that you just kept adjusting a base formula until it produced the kind of results you wanted to find. special k - sorry, man...imperially and heuristically...don't worry, I didn't adjust looking for a particular outcome...just interested in discovering the most efficient one to use from a coaching standpoint.